Having now read five of Jo Walton’s books, it’s probably time I said something about them. But what to say? They are all solidly entertaining and competently written yet, with each one, there was always something just a little off. Sometimes I could pinpoint what that was; other times it was just a niggling sense while reading that something wasn’t working properly. It wasn’t entirely distracting (except in Farthing, which I’ll talk about later) but it was certainly something I felt while reading each book. Before I start picking things apart, do know that I did enjoy reading these and think they are fun, intelligent novels that I would heartily recommend to any reader. I started with Tooth and Claw, which is absolutely my favourite of Walton’s books. Both Ana and Marg wrote excellent, detailed reviews when they read it and it was their enthusiasm that led me to it in the first place. Inspired by Anthony Trollope’s works, particularly Framley Parsonage, Walton has created a loyal tribute to the Victorian novel, opening at the deathbed of the family patriarch then moving on, like any good Victorian novel, to the ensuing feud and lawsuit over the will, the romantic concerns of the maiden daughters, the tense political machinations in one son’s city workplace and the crisis of conscious faced by the clergyman son, troubled by his father’s last confession. The twist, as you’re almost certainly aware, is that all of the characters are dragons. 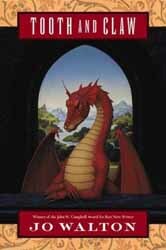 Honesty, I would have enjoyed this without the dragons (for I do love a nice, busy Victorian family drama) but the dragons add a touch of brilliance to an otherwise familiar story with even more familiar stock characters. Around them, Walton has created a rich, rigid fantasy world, with social conventions every bit as strict as the Victorians’, a world made so much more fascinating by its originality. I had been so sceptical going in (because, really, dragons? In a Victorian-style novel?) but I was shocked by how quickly Walton pulled me into their world. Within a few pages, it seemed perfectly natural that yes, these were dragons and of course this is how they behave. Admittedly, a little more energy was put into creating a fascinating society than into original characters but I think it was a wise choice. The characters and the dilemmas they face are familiar which, in a novel so full of the unfamiliar, anchors the reader. 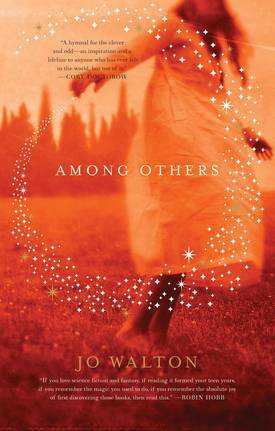 From there, I moved on to Walton’s most recent book: Among Others. Now, the first thing to love about this book is that the heroine, Morwenna Phelps, is a reader. Before anything else, that is how she defines herself, which means the novel is full of glowing passages about books and libraries and their general wonderfulness (example: “Interlibrary loans are a wonder of the world and a glory of civilization”). Can’t complain about that. Specifically, Mori is a huge fan of science fiction and there are a number of book-specific discussions that I am sure would delight anyone who shares her reading tastes. The story begins with fifteen-year old Mori preparing to head off to boarding school while currently living with a father she barely knows and sinister, disapproving aunts. Her twin sister is dead, Mori is crippled, and her mother is an evil witch, all of which adds something distinctly different to this story. It is not every heroine who can commune with faeries. The real interest and virtue here, though, lies in Morwenna’s intellectual development, mostly through her reading and her discussions with the book group she meets at the public library. At school, she is a conscious outsider, generally happy to maintain her distance from and her prejudices about her classmates, but among her fellow readers, people who share her tastes in books, she comes alive. I found Mori’s reading, her search for friends and her adjustment to her new school and her unknown father all very interesting but I’m not sure if the fantastic element of the book (encounters with faeries and her mother the witch) really added anything. Mori spends a lot of time explaining (the book is in diary format) how evil her mother is and how she and Morganna had to stop her but the reader never really sees the evil Mori is so determined to destroy. When Mori’s mother does appear, it felt bizarrely out of place. In a novel that is so much about internal development, this external villain seemed awkwardly tacked on. It is a gripping read – Walton has a special genius for writing in a way that makes it impossible to put the book down – but there was nothing about it that resonated with me, no character I became attached to, nothing that stood out as particularly memorable or special. I know a lot of other readers adored this and found it amazing but that did not happen for me. The only thing that really stands out in my memory is my frustration with Mori’s need to constantly assert that, though she attends a nice boarding school and her father lives in a nice house, they didn’t have money. Why was it necessary to a.) make Daniel poor and dependent on his sisters, and b) have Mori be so ashamed of the appearance of wealth? All the wealthy girls at the school are, unsurprisingly, disparaged. I am so frustrated and disappointed when a writer stereotypes in this way. Somewhat more sceptical after that, I started in on Walton’s Small Change trilogy. Beginning in 1949, these books take place in post-war Britain but not as we know it. In 1941, Britain made ‘Peace with Honour’ with Hitler, handing over complete control of the Continent, allowing the Reich to devote its energies to war with Russia, and creating a very different world from the one we live in. British civil liberties have been distinctly curtailed, anti-Semitism is, if not officially condoned, then at least more blatant than ever before, and, within parliament, a set of politicians sympathetic to the style and aims of the Third Reich are seeking to gain more power, by any means – even murder. Farthing, the first book in the trilogy, begins with the death of Sir James Thirkie, who, in 1941, was the architect of the Peace, at Farthing, the country house where the influential, semi-fascist politicians of the so-called Farthing set gather. The married daughter of the house, Lucy Kahn, and her husband David had been unexpectedly invited to join the house party that weekend. After the murder, it quickly becomes clear that David was invited so that the murder could be blamed on him. As a Jewish person in an increasingly anti-Semitic Britain, he is the perfect scapegoat. The book alternates between two perspectives: that of Lucy Kahn and of Scotland Yard Inspector Peter Carmichael. Lucy’s babbling first-person narrative overwhelms the reader with significant details that the police are completely oblivious to, as Carmichael’s steady approach to the case turns up all the logical but misleading answers. The two perspectives merge into one engrossing story, revealing not just the murderer but a society even more disturbing than the reader had imagined, where justice and truth have very little place. But if Walton is clever with her pacing and her entwining of Lucy and Carmichael’s stories, she is completely lacking in subtlety. If a point is going to be made, it is best to hammer it in five or six or more times in the most blatant language possible. The most ridiculous example has to be Walton’s ‘casual’ insertion of homo- and bi-sexual characters (pretty much every second person who showed up). Oh dear, it’s awkward and clumsy. And the hilarious significance attached to how characters took their tea made me wish desperately that they would all switch to hard liquor. In a country-house mystery, you can imagine how many times tea is served. When Carmichael isn’t rhapsodizing about his favourite tea (I wanted to drown him in it by the end) someone else is making suggestive remarks based on his choice. It was just so heavy-handed that it became almost embarrassing. 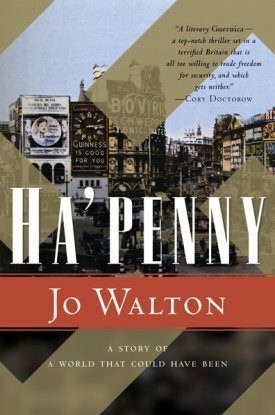 However, as usual, Walton has created a very real world and, despite my frustrations with Farthing, I immediately moved on to Ha’penny, eager to be back in this menacing alternate Britain. Here, Carmichael is still our detective and Lucy Kahn is traded in for a new female narrator: Viola Lark. Viola is an actress from a privileged background who is rehearsing a new production of Hamlet, to be performed in front of the Prime Minister and Hitler, on the German leader’s much-anticipated Friendship visit to London. When her co-star is killed by a bomb, Viola suddenly finds herself back in contact with one of her estranged sisters and pulled into a plot to assassinate the two leaders. Carmichael, while investigating the other actress’ death, slowly begins to uncover the murder plot and even more of the conspiracies at the heart of the government. We were strange obsessive children, and we became strange obsessive adults. Tess went to Oxford and had her debutante year and got married appropriately, safely, to Sir James Thirkie, baronet. Pip demanded, and got, a finishing year abroad to learn German, did learn German, contrived to meet Hitler and managed to hook a leading Nazi as a husband. During the war, when German bombers were flattening London, and killing poor Tess in her shelter for government wives, we felt bad about Pip’s position, but all was forgiven later, as all was forgiven the Germans generally. I became an actress. Siddy came out, married, had a baby, divorced, caused scandal by leaving the baby with her husband, visited Moscow and became a real communist, married again, and rapidly divorced again. Dodo paints, and has the occasional exhibition, is married to a prominent scientist who has something to do with atomic research, and has two delightful children. Rosie, whose obsession was the most normal, came out, rode to hounds, met and married the Duke of Lancashire and produced sons…My sisters – I don’t necessarily like them, and I’d rather be stuck with pins than spend a week alone with any of them, but I love them. Yeah, subtlety: not really Walton’s thing (further proof of that: the ‘leading Nazi’ husband is no one less than Himmler). It’s all amusing nonetheless, particularly for Mitford-loving readers. Finally, there is Half a Crown, the strongest of the three novels, made so by its convincing female narrator and much more logical progression. There is a lamentable return to tea as the prime topic of conversation but I can just about forgive that. The contrast of Carmichael, now head of the Gestapo-like Watch as well as the leader of the secret Inner Watch (which rescues and ships Watch detainees and Jews to safety – a sort of underground railway) and Elvira Royston, his debutante ward who begins the book oblivious to the evils of the government, believing fascism is ‘fun’, is the most effective juxtaposition of the series. Both characters develop more over the course of the novel than anyone in the earlier books and do so, more importantly, in a rational manner. Set in 1960, the tension, after more than 10 years under an intrusive and constructive government, is far more extreme than in the earlier books and much more terrifying. Of all the characters we are introduced to in the three books, Elvira is the only one I felt real sympathy towards. Elvira is granted no extraordinary powers. She is intelligent but young and trusting, a product of the society in which she was raised. She knows that if you see something suspicious, if you hear someone disparaging the government, you should report it. That is what keeps society ordered and safe. She even believes that after she is arrested and interrogated. It isn’t until after her second arrest, having committed no crime, that she begins to really understand just how sinister and dangerous the establishment has become. She is not cunning but she is brave and capable and the dramatic ending is rather magnificent. A bit absurd and optimistic in the world Walton has created and wildly contrary to the tone of the series, but magnificent nonetheless. Elvira still has faith and trust that at least one person can put everything to right again and that person does. It is completely wonderful and ridiculous and I loved it. 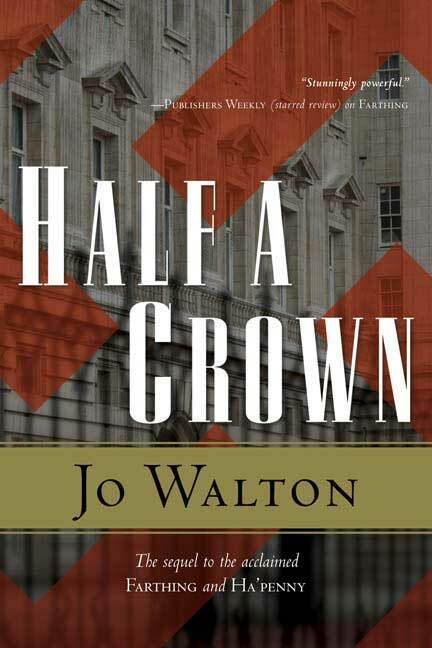 Half a Crown rewards the reader’s investment in the first two, less impressive books with an outstanding conclusion that makes full use of the terrifying society Walton crafted. I’ve voiced a lot of my annoyances with these books but I really must stress how much I enjoyed reading them. Some authors, very few, have the talent of plotting and executing stories in such a way that the reader can’t tear him- or herself away. Walton does this brilliantly. I am not sure I’ve ever come across someone who is as effortlessly readable. Even when I was cringing during Among Others and Farthing, I could not put them down. One sentence flowed into another, I flew from one page to the next, and so on until I came to the end. Sometimes Walton’s and my tastes and styles did not align but I remain convinced that these are solidly good books and imaginative, entertaining reads. Excellent commentary on Walton’s books. As much as I enjoyed Tooth and Claw, I still haven’t actually read any more of her books! Must rerequest Among Others from the library. You really must, Marg! While Tooth and Claw remains my favourite, I think all of her books are really interesting and well worth trying. Among Others is the most biographical of her novels; I think the boarding school stuff is drawn strongly from her own life (especially the reading bits). It makes sense to me that her dad’s poverty and her disdain for wealth go together; most kids will try to despise what they can’t have. And Mor definitely can’t get the approval of her sports crazy peers at school. Her other books, Lifeload and the three books in The King series are also interesting, also very different from each other, and very different among their kind. The first is a very interesting fantasy that does nifty things with time and family; the second is a series that has an absolutely fresh take on king author-type books. I haven’t heard of this author, but recently I’ve started to get into Fantasy novels. Maybe I’ll give it a go and see if I can pinpoint what is a little off. But like you said, not many authors can pull off a novel brilliantly. Walton is definitely worth a try, especially if you’re easing your way into fantasy! You had me at ‘Viola Lark’. How is it that I’ve never heard of these books!? I hadn’t heard of the Small Change books until late December or early January, after I’d read Tooth and Claw, so don’t worry too much! It might be a little sad that I found the Mitford-parallel the most intriguing (and definitely most amusing) part of Ha’penny but it was fun! I skimmed through this since I’ve read only Farthing, and I didn’t want to risk spoilers – but Anthony Trollope’s name caught my eye. You had me at Trollope and dragons. Despite some initial reservations, I have really enjoyed Naomi Novik’s Temeraire series, which is Patrick O’Brian with dragons. Oh my goodness yes, you must try Tooth and Claw, Lisa! I can’t wait to hear what you think of it! Thanks for this Walton review. I just read Among Others, and am ready to find more. You’ve certainly got lots of variety to choose from, Susan! Really looking forward to Tooth and Claw now. It’s really enjoyable, Linda! I hope you like it as much as I did. I’ve read Farthing, Ha’Penny and Half a Crown only (reviews up on two of them) and I alternately loved it/hated it. I liked the writing and what may have been and disliked intensely the racial bigotry that was portrayed in all three of the books. I had to tell myself its fiction because to reconcile these images in my mind was very hard. I thought the stories as stories were very good though. I found Walton’s descriptions of the anti-semitism in her alternate Britain interesting but I can easily see how you could have found them upsetting. What I did wish is that she had done a little more to show how other ethnic minority groups and political opponents were being treated, rather than focusing so much on Jewish people and homosexuals. To me, it felt a little limited. It’s interesting how differently you felt about the Small Change trilogy than I did! I found the conclusion to the series really, really frustrating, and I have always pretended to myself that it ended differently than how it really ended. It seemed very deus ex machina to me. For me, so much of the story, through all three books, developed in a quite unbelievable manner so, while I found the ending ridiculous convenient, I was more amused than anything! That was the same order I started reading Walton in and I was feeling discouraged after Among Others but I am glad I tried the Small Change trilogy. It’s not as wonderful as Tooth and Claw but it’s very interesting. 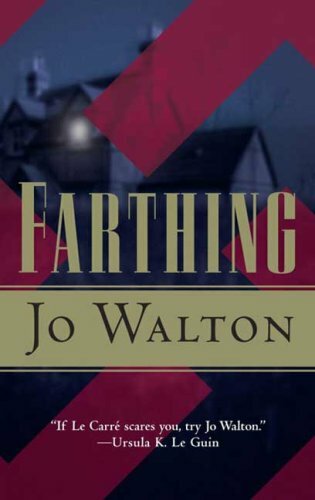 Currently reading Farthing at the moment – my first Jo Walton book. So I skimmed your reviews of the second two books. I actually know little about the Mitfords so I hope that doesn’t impact my enjoyment of the second two books.